I came to Lutheran Christianity and the ELCA only in my late 20s. I had grown up in various Christian denominations and nondenominations. But a Daniel Erlander cartoon posted on a door at Jacob’s Porch, Ohio State’s Lutheran campus ministry, made me want to find out more about this particular tribe of Christians. The caption on the image said something to the effect that Lutherans are Christians who claim to be born again … and again, and again, and again. This resonated deeply with my experience of having been claimed and called by God into new life many times over since I became a Christian. This week’s lectionary passages point us toward God’s ongoing redemptive work. God is not content to set God’s people free once. But every time we stumble and fall, God is anxious to lift us back up. Even the most cursory reading of the Hebrew Bible uncovers tales of God repeatedly saving God’s people. After freeing the Israelites from Pharaoh’s oppression in Egypt, God sends judges to free the people when they are subjugated in their homeland. After miraculously relieving the Assyrian siege of Jerusalem in Elisha’s time, God redeems Judahites from their exile in Babylon. The ongoing role of the Lord as the protector and redeemer of God’s people is explicit in Isaiah. God reminds the people that they were freed by God who made “a way in the sea, a path in the mighty waters” (Isaiah 43:16). God then said, “I am about to do a new thing. … I will make a way in the wilderness and rivers in the desert” (Isaiah 43:19). Whereas God had once freed the Israelites from Egypt by making a dry path through the sea, later God made a well-watered path through the desert to redeem them from Babylon. The point is that wherever God’s people find themselves trapped, God will make a way toward freedom. God has redeemed us. God is redeeming us. God will redeem us. Because the Israelites were so well acquainted with God’s repeated redemptions, they were confident enough to pray for yet more freedom. I love Psalm 126 because it captures not only that ongoing gratitude and trust in God but also a yearning for God’s work in the world to be completed soon. The passage begins by saying that when God restored the captives to Zion, the people felt as if they were dreaming, and they were filled with joyful laughter. Only a few verses later, however, the psalmist begs for God to redeem the captives not yet released (Psalm 126:4). The psalm ends with the assurance that those who weep will soon be made joyful. God has redeemed us. God is redeeming us. God will redeem us. The best picture of God’s ongoing redemption, in my opinion, comes from John 12. In this week’s reading, Jesus’ close friends throw a party to celebrate his raising of Lazarus from the dead. 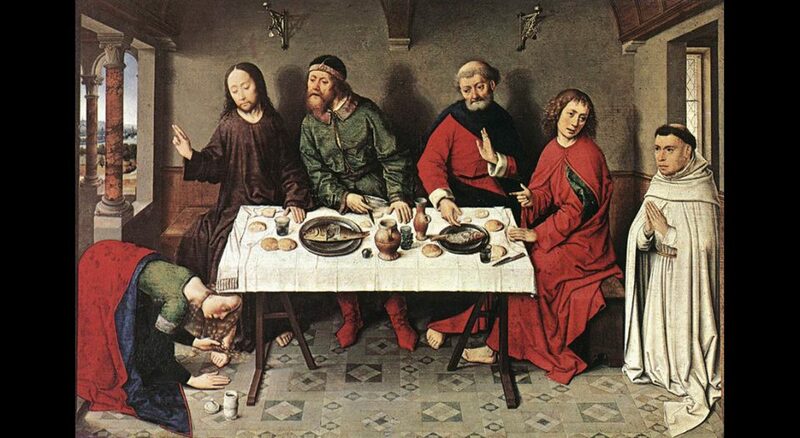 Martha serves a delicious meal while the freshly resurrected Lazarus reclines with Jesus. Mary returns to her customary place at Jesus’ feet (Luke 10:39), but instead of learning with the rest of his disciples, this time she anoints his feet with costly perfume (John 12:3). This beautiful picture of a brother returned to his sisters and people lovingly celebrating Jesus for demonstrating that he is the resurrection (John 11:25) could have been enough. Jesus demonstrates power over death and speaks the words of eternal life (John 6:68). He has already rescued and redeemed one of his friends from the power of death and decay. He is being celebrated, surrounded by those he loved. But Jesus had more to do. Having mounted a rescue mission to free one captive of death was not enough. Jesus would not just redeem and resurrect a few humans piecemeal. Rather, he would die to redeem all people from the powers of sin and death (Romans 5:18). Our God is not satisfied with a little salvation or a moderate amount of redemption. Scripture testifies that God’s work—especially God’s saving mission as demonstrated through the life, death and resurrection of Jesus—is ongoing. God is not willing that any should perish (2 Peter 3:9), so he keeps pursuing us to bring us to redemption from sin and death. In this season of Lent, as we meditate on the lengths to which Jesus went to save us, let us honor his self-sacrifice by reflecting on the ways that God continues to redeem and restore us and our neighbors daily.